Before you begin: Mix your dyes and prepare your work surface by laying down a sheet of plastic, then putting your baking rack on top. Bind the right side of your shorts with the zip tie as shown. Squeeze the green dye directly over the zip tie area. Now squeeze the red dye onto the gathered end. Don't squeeze completely til it meets the green dye. The dye naturally seeps together, so no need to over-dye. Cover the shorts with some plastic wrap and let it set for 6-8 hours. Once your dye has set, cut off your zip tie and rinse out the color in the sink. 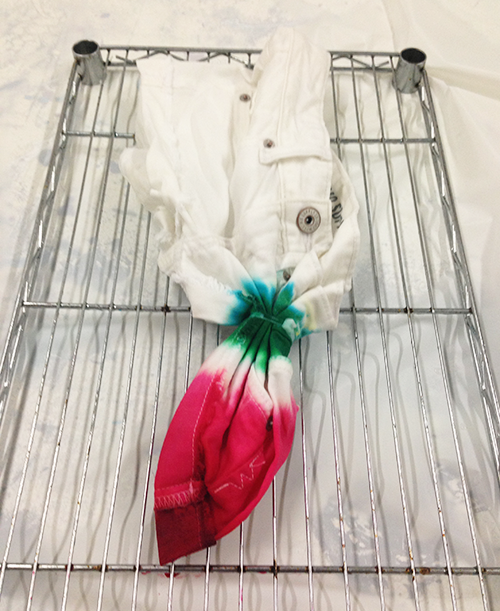 Be careful to keep the white part of the shorts away from the dye being rinsed out, so the white area doesn't dye. Once you are finished rinsing, throw the shorts in the dryer or let them air dry. Once dry, apply crystals using heat-setting tool in seed shapes as shown. We used about six crystals for each seed. If you don't have the crystals you could always make seeds by free handing the design with some Tulip Soft Paint or Tulip Fabric Markers. 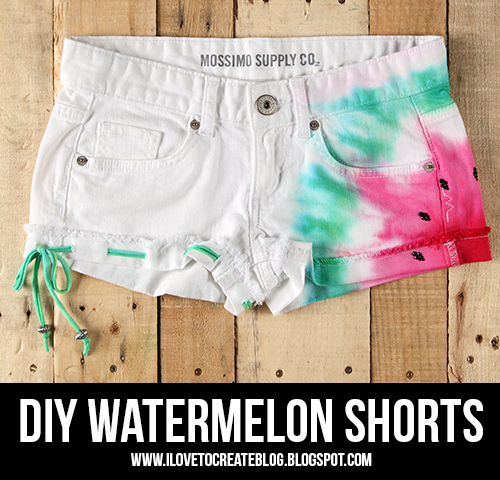 For another fun touch, snip the bottom leg of the shorts (the side opposite of the watermelon pattern) with your scissors and weave in a piece of tshirt fabric or ribbon (we actually used the remnants of a shirt dyed with Tulip One-Step Tie-Dye). Tie at the side in a bow and apply pony beads if you want. 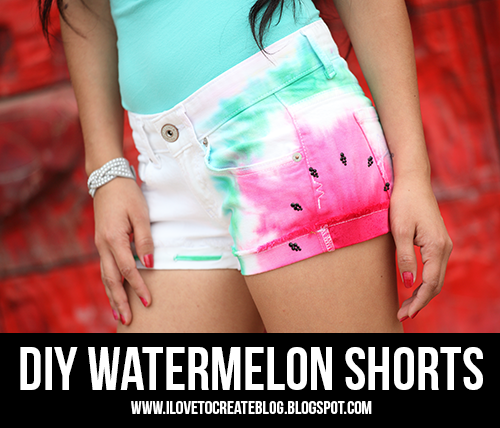 I'm sure these watermelon shorts will be the talk of the next picnic or party you attend. It's always fun to add a little "slice" of fun to your summer wardrobe. OMG THESE ARE SO CUTE!! U R A GENIOUS!! Wow! We have been tie-dying for years and never thought to make it into a watermelon using something to look like seeds >.< awesome you can see ours here tie dye shirts keep on dying! I collected your idea in my last post. I made a RANKING OF THE BESTS DIY SHORTS FOR SUMMER. Mine didn't come out as good. They look okay.